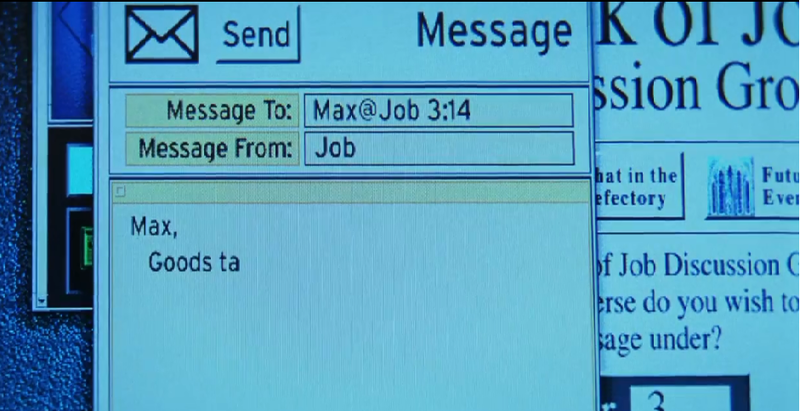 In the movie Mission Impossible (1996) we see a scene where Ethan returns to the mission base (referred as Crow's Nest by Phelps) and after understanding that Job 3:14 was a reference from The Bible, he sends emails to Max. My Question: How did Ethan know Max's email id? From just the previous conversation with Kittridge we see Ethan gets to know this name "Max" and the code " Job3:14" for the first time. Once he returns, and once he understands that its from The Bible, he accesses "Usenet" and tries opening "Book of Job". But the email window doesn't open with the recipient email id already, Ethan types "Max@Job 3:14" which implies he knew what Max's email was. Ethan sends many emails,but keeps the email id constant. He alters the language only. I did a quick search in the IMDb plot holes list but the only one entry regarding sending mails to Max, doesn't quite answer this issue. It should also be noted that Ethan sends many emails to try and contact Max...not just one. Ethan returns to the IMF safe house, where he uses the internet to find Job. Looking over the screen of his laptop, he sees a Bible on a bookshelf above the screen and deduces that "job 3:14" actually means the Book of Job, chapter 3, verse 14. Ethan begins to email as many web entities with the name Job 3:14 as he can before falling asleep. It's already established that the arm dealer who is the target of the film is called, or at least goes by the name of, "Max". Meeting with IMF director Eugene Kittridge, Hunt reveals his awareness of a second IMF team sent to monitor them, and learns the job was a setup to lure out a mole within IMF, who is believed to be working with an arms dealer known as "Max" as part of "Job 314." As Hunt is the only member left, Kittridge suspects him of being the mole, and Hunt flees. Not the answer you're looking for? Browse other questions tagged plot-explanation mission-impossible mission-impossible-1996 . Has Ethan Hunt ever refused a mission? How does Ethan know that Phelps is the mole? In Mission Impossible 1, why didn't Phelps kill Ethan as easily as his wife? Why did Niki Lauda envy James Hunt? How did DJ know this? How did Banner know Dr.Strange? Why did Ethan Hunt dream of Solomon Lane with a beard?